Early College of Medicine faculty, including Maren, at Ceder Key in 1955. Dr. Maren’s first faculty photo at UF. The University of Florida College of Medicine was started in 1955 under the leadership of its first dean, Dr. George Harrell. In that year, Thomas H. Maren, M.D., was recruited as the founding chair of the Department of Pharmacology and Therapeutics, shortly followed by the first medical student class in 1956. 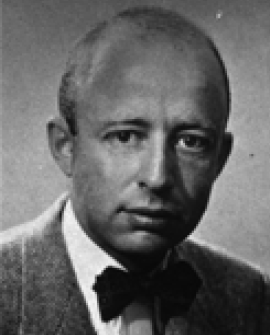 In 1955, George Harrell, M.D. was appointed the first dean of the UF College of Medicine. As the Medical Sciences Building and the Shands Hospital were being constructed, Dr. Harrell was charged with recruiting the faculty of the new College of Medicine. The third faculty member he hired was Thomas H. Maren, M.D., who was to establish the Department of Pharmacology and Therapeutics and be its first chair. Dr. Maren was a graduate of the Johns Hopkins School of Medicine, where he studied under the mentorship of E. K. Marshall, M.D., Ph.D., the chair of Pharmacology and the successor in that role to John Abel, M.D., the researcher who brought modern pharmacology from Europe to the US. After graduation, Dr. Maren spent four years at American Cyanamid Company where he established the pharmacology of acetazolamide, the first clinically available inhibitor of carbonic anhydrase—a drug still used today. When he was appointed chair of Pharmacology at UF, he was just four years out of medical school at the age of 37 years. The first appointment Dr. Maren made to establish the new pharmacology department was Kenneth C. Leibman, Ph.D., a biochemist trained at the University of Wisconsin. Dr. Leibman remained in the UF pharmacology department for his entire research career and achieved widespread recognition for his studies of drug metabolism, especially metabolism of the carbon-carbon double bond and its epoxide pathway. As a senior member of the department in 1973, he became the founding editor of the Journal of Drug Metabolism and Disposition. The second faculty member hired was Dr. Bohdan Nechay, a veterinarian and renal physiologist who worked in the department for about ten years. Later, Dr. Nechay moved to the University of Texas Medical Branch at Galveston. Other early appointments in the Department of Pharmacology include David Travis, M.D., a respiratory physician and physiologist, Aaron Anton, Ph.D., a pharmacologist from Yale, and Lucy Birzis, Ph.D., a neurophysiologist. Other early appointments in the department made major contributions to research and teaching. Thomas F. Muther, Ph.D., was a Swiss expatriate trained at the University of Leeds. Dr. Muther’s research efforts included drug induced teratology and histological localization of carbonic anhydrase. With an excellent sense of humor and wide knowledge of pharmacology, Dr. Muther was one of the department’s most outstanding teachers. He spent his entire professional career in the UF Department of Pharmacology. Roger F. Palmer, M.D., was in the first graduating class of the UF College of Medicine. After a residency in internal medicine at Johns Hopkins, Dr. Palmer accepted an assistant professorship in the UF Department of Pharmacology. He developed a teaching program that incorporated pharmacology into the clinical years of study rather than just within the basic science years and received many teaching awards. In 1969, he moved to the University of Miami School of Medicine and a year later became chair of their pharmacology department. Another early hire was W. Walter Oppelt, M.D., a Harvard trained pharmacologist with clinical expertise in cancer chemotherapy. Dr. Oppelt was also an outstanding teacher and mentor. He trained Warren Ross, M.D., later a member of the UF Department of Pharmacology and in the 1980s, a senior executive associate dean of the College of Medicine. Lal Garg, Ph.D.—the first Ph.D. awarded in the graduate research program in the UF Department of Pharmacology—also trained in the lab of Dr. Oppelt. Unfortunately, Dr. Oppelt suffered a brain tumor around 1970 and died a few years later. He was a very influential guide in the professional careers of many students at UF. Another very productive member of the UF Department of Pharmacology in its initial years was George C. Y. Chiou, a Ph.D. in pharmacology trained at Vanderbilt University. Dr. Chiou’s lab examined autonomic pharmacology and later emphasized ocular pharmacology. He had a very active lab in the department and left around 1978 to become the professor of pharmacology at Texas A&M University and the director of its Institute of Ocular Pharmacology. He was a founding editor of the Journal of Ocular Pharmacology and Therapeutics. While at UF, Dr. Chiou mentored many graduate students, including Lynn Wecker, Ph.D., who became a Distinguished Research Professor at the University of South Florida with many accumulated honors. Dr. Wecker was president of the American Society for Pharmacology and Experimental Therapeutics (ASPET; 2011-2012). Meanwhile, Dr. Maren advanced his program of very broad studies into the catalytic mechanism and physiological function of carbonic anhydrase in many species, and most importantly, the pharmacological effects of inhibition of this enzyme. Dr. Maren’s Program Project Grant from the NIH funded many labs and researchers in the department. Under his leadership, a well-funded research program in antimalarials was also active in the department. With his guidance and influence, several researchers studying carbonic anhydrase were appointed to assistant professorships in the department and later obtained tenure. Dr. Muther was one. Another was Dr. Garg, who studied isozymes of human carbonic anhydrase and is credited with discovering the most abundant form of this enzyme in humans: carbonic anhydrase III, found predominantly in skeletal muscle. Later, Dr. Garg’s research emphasized the presence and function of various ATPases in individual nephron segments. Dr. Garg spent his professional career in the UF Department of Pharmacology. Included among the faculty working on carbonic anhydrase was Betty P. Vogh, a Ph.D. who had trained in the UF Department of Physiology. Dr.Vogh carried out studies of ion transport and fluid formation in the eye and cerebrosphinal fluids and the reduction of these secretions caused by inhibition of carbonic anhydrase. Dr. Vogh was an excellent and conscientious teacher and research mentor. Among her graduate students was J. R. Haywood, Ph.D., who became chair of Pharmacology and Toxicology at Michigan State University and later an Assistant Vice President in their Office of Regulatory Affairs. Two of Dr. Maren’s later hires came as assistant professors in 1971, both remaining in the department for their entire professional careers. William R. Kem, Ph.D., was trained at the University of Illinois and later did a postdoc with Dr. Toshio Narahashi at Duke University, a founding father in neurotoxicology. Dr. Kem established a research program in naturally-occurring toxins and in marine pharmacology. One of his students, William Doyle, M.D., Ph.D., later became a member of the UF Department of Ophthalmology. David N. Silverman, Ph.D., trained at Columbia University and later did postdoctoral studies at Cornell with Dr. Harold A. Scheraga. His research emphasized enzyme mechanisms. With long-time collaborator Chingkuang Tu, Ph.D., he made a fundamental discovery in the mechanism of proton transfer in fast enzymes as exemplified in carbonic anhydrase, a mechanism described in many undergraduate biochemistry textbooks. Dr. Silverman served as Associate Dean for Research in the UF College of Medicine (1986-1990) and as interim chair of Pharmacology (2013-2014). The Department of Pharmacology under Dr. Maren’s leadership was recognized nationwide. He served as president of the Association of Medical School Pharmacology Chairs. In the 1970s, the department was listed among the top twenty pharmacology departments in the country. Under Dr. Maren’s leadership and by his own example, teaching was a primary responsibility of the faculty. Initiated and administered by Dr. Maren, the College of Medicine for its first dozen years required two hundred hours of independent research for medical students. In the early 1970s, the College of Medicine began a Junior Honors program to recruit very bright students into our medical school and accelerate their undergraduate studies. For over twenty years, Dr. Maren led these students in learning pharmacology in a seminar format. This responsibility then transferred to Dr. William Kem, who led the Junior Honors program for close to twenty years. At various times, the faculty in the Department of Pharmacology in the College of Medicine taught pharmacology in the Colleges of Pharmacy, Veterinary Medicine, Nursing, Dentistry, and in the School of Physician Assistant Studies. In 1977, after 22 years as chair, Dr. Maren announced his intention to relinquish his role as chair and continue research and teaching in the department as a graduate research professor. The search committee for a new chair was led by Kenneth I. Berns, M.D., Ph.D., then the chair of Microbiology and later the dean of the UF College of Medicine and Vice-President for Health Affairs. The search committee selected Allen H. Neims, M.D., Ph.D., as the new chair. Dr. Neims obtained both these degrees at Johns Hopkins, completed a residency in pediatrics, and at McGill University established a research presence in the area of drug metabolism, especially the metabolism and clinical effects of caffeine. When he arrived as chair of the UF Department of Pharmacology in 1978, it was a department with exceptional depth in areas related to the biochemistry, physiology, and pharmacology of carbonic anhydrase. This culminated in a patent on the design of topical inhibitors of carbonic anhydrase in the control of glaucoma, described below. Dr. Neims transformed the department into one of breadth in pharmacology to fit into its expanding teaching responsibilities and to better integrate into the growing and broadening research in the College of Medicine. Accordingly, Dr. Neims led a remarkable recruitment effort that, within a few years, had attracted to the UF Department of Pharmacology very promising young faculty. In doing this and in leading the department, Dr. Neims demonstrated progressive and insightful administrative and leadership skills that were recognized campus-wide. In 1989, he led the faculty search committee that recruited Dr. John Lombardi as president of the university, and in 1990, he was appointed Dean of the UF College of Medicine. The Department of Pharmacology changed rapidly with Dr. Neims as chair. In a few years, several new assistant professors were on board. The first was Kathleen Shiverick, Ph.D., who was a colleague of Dr. Neims at McGill. Dr. Shiverick established her lab in the areas of drug metabolism and in the reproductive toxicity of environmental pollutants. An outstanding teacher, Dr. Shiverick was a strong contributor to the teaching program and an excellent role model to the increasing number of women in the professional and graduate programs of the college. Upon retirement, she was given a lifetime achievement award by the college. Fulton T. Crews, Ph.D., was trained at the University of Michigan and in the NIH lab of the nobel laureate Dr. Julius Axelrod. Dr. Crews had many areas of research interests, mainly in the role of membranes in cell function, such as the relationship between membrane properties and the function of neuronal receptors. Dr. Crews was a popular teacher and consistently selected by the students as the college’s best-looking instructor. In the mid 1990s, Dr. Crews moved to the University of North Carolina School of Medicine to head their Center for Alcohol Studies. Steven R. Childers, received a Ph.D. from the University of Wisconsin, and as a new assistant professor in the UF Department of Pharmacology, he established his lab in the area of neurotransmitters with an emphasis on the synthesis of opioid peptides in the brain and characterization of the brain opiate system. He later joined the Department of Physiology and Pharmacology at the Wake Forest School of Medicine. Also recruited to the department at that time was Stephen P. Baker, Ph.D., trained at the University of Aston in England and in a postdoc with Dr. Lincoln Potter at the University of Miami. His research on the pharmacology and biochemistry of autonomic receptors and his success in teaching led to his appointment as chair of Pharmacology in 1990. Further recruitments included Edwin M. Meyer, Ph.D., trained in the neuropharmacology lab of Dr. Richard Wurtman at MIT. Later the department appointed Thomas C. Rowe, Ph.D., as assistant professor in 1985. Dr. Rowe obtained his doctoral degree from the University of Florida in microbiology and trained as a postdoc at Johns Hopkins. He was appointed in 2015 as Associate Dean for Graduate Education and director of the Interdisciplinary Program in Biomedical Sciences in the UF College of Medicine. Dr. Neims promoted a very congenial and open department while emphasizing excellence and high scholarship in teaching and research. To enhance communication and collaboration among faculty students, he initiated weekly dinners for faculty, often with the week’s guest seminar speaker; graduate students could also attend. The department attracted outstanding joint appointments: Luiz Bellardinelli, M.D. ; Eugene Goldberg, Ph.D.; Michael Greenberg, Ph.D., Director of the Whitney Marine Lab; Margaret James, Ph.D.; Howard M. Johnson, Ph.D.; Matthew Knight, M.D. ; Peter Stacpoole, M.D. who became director of UF’s Clinical and Translational Science Institute; and Christopher S. Wilcox, M.D. When Dr. Neims was appointed Dean of the College of Medicine in 1990, a national search was initiated for a new chair in the Department of Pharmacology. The search committee, department faculty, and the new Dean agreed that the best candidate was already in the department: Dr. Stephen Baker. Dr. Baker assumed the role of chair just as the department moved into the then new Academic Research Building, occupying nearly the entire fifth floor. He was very supportive of the pharmacology faculty and students in their research efforts, and as an outstanding teacher himself, he led the department’s teaching efforts by his own example. The second-year pharmacology course was voted best pre-clinical course by the medical students, and its coordinator, Dr. Rowe, was voted basic science teacher of the year. Excellent faculty were recruited into the department and encouraged under Dr. Baker’s leadership. Three of those faculty, Roger L. Papke, Ph.D., Jeffrey Harrison, Ph.D., and Brian Law, Ph.D., are currently active in the department, and their research interests can be found on the department’s website. During this time, Philip Scarpace, Ph.D., transferred from the Veterans Administration system to become a full-time faculty member in the Department of Pharmacology, his research on obesity emphasizing the role of leptin. Also transferring from the VA to become a part-time faculty member, Nihal Tumer, Ph.D., examined neuronal mechanisms of obesity. A major patent for the University of Florida was based on research in the Department of Pharmacology. The lab of Dr. Thomas Maren in the early 1980s began to work on developing a carbonic anhydrase inhibitor to control glaucoma, a drug that could be given as eye drops rather than by mouth. For decades, it had been regarded as impossible to synthesize a carbonic anhydrase inhibitor that could cross the cornea. Dr. Maren’s lab showed that this was incorrect and synthesized inhibitors given topically that were effective in controlling glaucoma. The resulting patent was licensed to Merck in 1986, which released Trusopt for clinic use in the mid-1990s. Trusopt was one of the most successful moneymakers in terms of the royalties it brought to UF. For years, the royalties from Trusopt brought in more money than any other invention, and among other benefits, funded the Thomas H. Maren, M.D., Eminent Scholar Chair in Pharmacology and Therapeutics and the Thomas H. Maren, M.D., Junior Investigators Research Fund. It is a remarkable comment on the stability and continuity of the UF Department of Pharmacology and Therapeutics that in 56 years, the department had only three chairs. In 2014, Jeffrey Martens, Ph.D., from the University of Michigan was recruited as the fourth chair. Largely using royalties from the Trusopt patent, Dr. Martens began a major recruitment of many new faculty, enhancing research and teaching efforts as the Department of Pharmacology entered another chapter in its development and history. Written by David N. Silverman, Ph.D.
Dr. Maren in his later years. Thomas H. Maren, M.D., came from a family of teachers in New York City. Entering Princeton University at age sixteen, Tom was a chemistry major with a strong interest in literature. Upon graduation in 1938, he took an additional year obtaining a master’s degree from Princeton in English literature. But Dr. Maren was strongly attracted to scientific research. He took a job as the sole researcher for a small pharmaceutical company, Wallace Labs of New Jersey, working on formulations of deodorants and depilatories. He convinced the lab director to allow him to pursue his own independent research on anti-parasitics using compounds developed in Wallace labs. This work was noticed by a prominent faculty member at the Johns Hopkins School of Public Health, who then recruited Dr. Maren to his research program developing medications to treat parasitic diseases. Dr. Maren’s creative and medically important research was recognized, and he was recruited into the Johns Hopkins Medical School in 1946. During his medical training he carried out research in the lab at Hopkins of the distinguished pharmacologist E. K. Marshall, M.D., Ph.D., on drugs affecting renal function. Having obtained his medical degree, Dr. Maren went to work at the research labs of American Cyanamid, taking advantage of his expertise in renal drugs. This led to his interest in the medical effects of the inhibition of carbonic anhydrase, a prominent enzyme in renal function, respiration, and fluid secretion. These topics guided him through his entire research career until his death in 1999. In 1955, Dr. Maren was recruited to be the first chair of the Department of Pharmacology and Therapeutics in the new medical school at the University of Florida. Here, he was a major influence in developing the medical curriculum and recruiting faculty. Continuing his research on the application to medicine of inhibition of carbonic anhydrase, he accumulated more than 200 research publications over a career of nearly 45 years at UF. His work elucidated the physiology of renal acidification, cerebrospinal fluid formation, and respiration, among other topics. 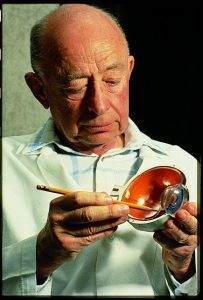 He is most known, however, for demonstrating to the medical community the treatment of glaucoma through the use of eye drops containing carefully designed inhibitors of carbonic anhydrase. When the royalties from Dr. Maren’s patent became available to him, he was a generous benefactor establishing endowed chairs at the UF College of Medicine and Johns Hopkins School of Medicine, funding a conference center at the Mount Desert Island Biological Lab in Maine, and supporting programs to promote reading efficiency among disadvantaged young students in Gainesville. Dr. Maren’s award acceptance by his son. 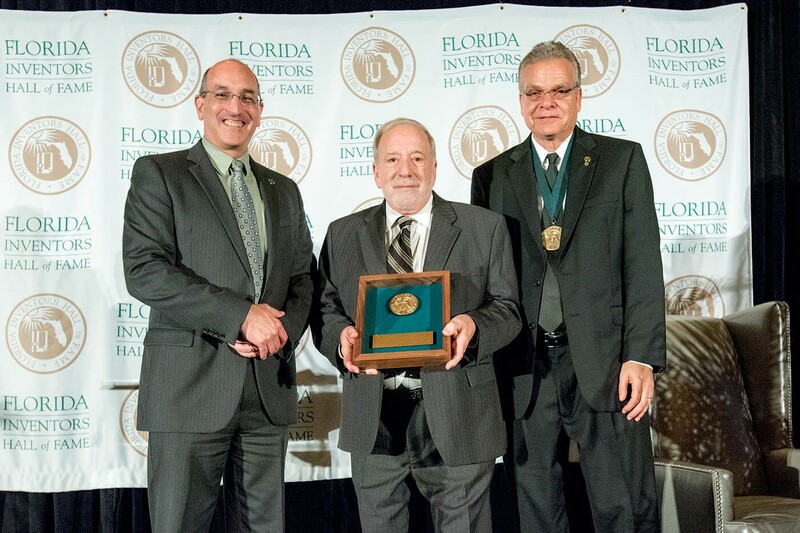 The Department of Pharmacology and Therapeutics is honored that its first chair, Thomas H. Maren, M.D., was selected for induction into the Florida Inventors Hall of Fame. Dr. Maren was cited for the development of topical medications in the control of glaucoma. This effort capped over four decades of research on the pharmacologic effects of the inhibition of carbonic anhydrase, research in which Dr. Maren trained undergraduate, graduate, and medical students at the University of Florida. As a founder and one of the first faculty to join the University of Florida College of Medicine, he was important in designing the initial medical curriculum, emphasizing the role of research, and promoting advanced courses that combined the basics of pharmacology and clinical medicine. He led the pharmacology department for 22 years as chair and subsequently was appointed a graduate research professor. When Dr. Maren passed away in 1999, he left a strong legacy of scholarship, research and teaching in the College of Medicine. The award was accepted on his behalf by his son.